“Big Blue” has not gotten a ton of attention during Vampire Weekend’s Father Of The Bride rollout — no music video, no live radio performance, no digitally altered Jenny Lewis sample — but man, what a gorgeous song. It’s a gentle ballad that seems to float just above the surface of the Earth, eventually blooming into ornate, folksy beauty like something George Harrison might have kicked out circa All Things Must Pass. Last night, the song got its live debut. 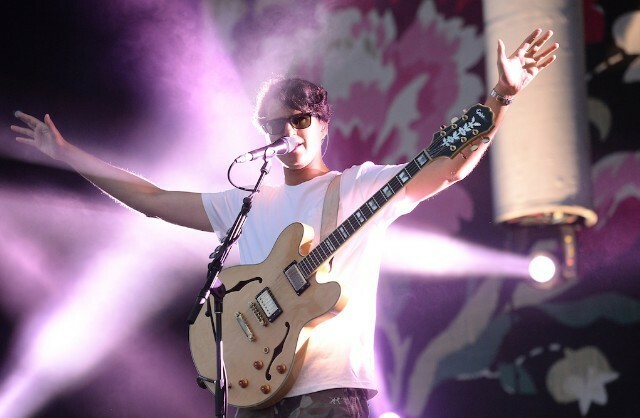 Vampire Weekend are in England playing some intimate shows to warm up for their summer tour. In its post-Rostam formulation, the band has expanded to a seven-piece live configuration, and at EartH, they stretched out “Big Blue” a bit, adding an extended bridge to indulge some of their newfound jammy tendencies. I once heard someone dismiss Modern Vampires Of The City as a wannabe Yankee Hotel Foxtrot, which, as someone who treasures both albums, is a ridiculous take. However, this performance does make it seem like Vampire Weekend have gone full Wilco. A fan captured full footage of the “Big Blue” performance, and you can watch it below. Father Of The Bride is out 5/3 on Columbia.